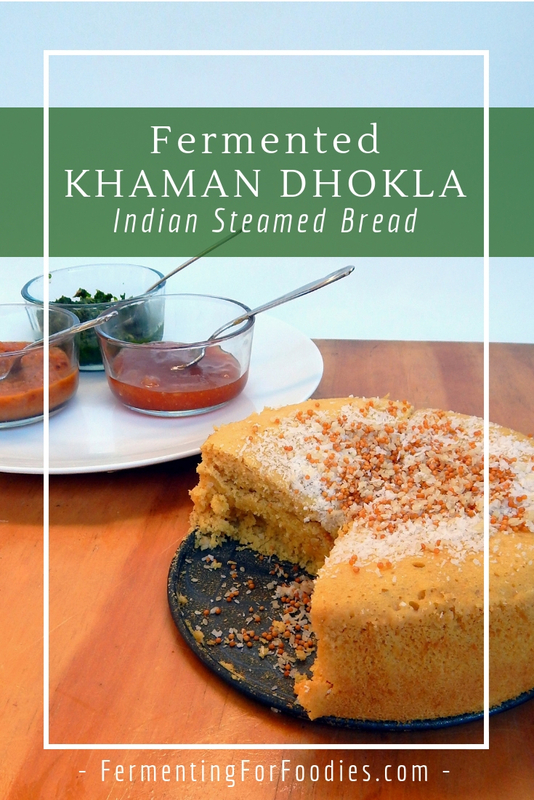 What exactly is fermented khaman dhokla? Well, a dhokla is an Indian steamed bread made from a fermented batter. It can be made from all sorts of different things: rice, barley, lentils, quinoa, chickpeas. They are fermented with yogurt, then the batter is steamed and topped with some spices. It has a cake-like structure and is traditionally eaten as a breakfast or snack item. It also works as a mild and filling bread for a spicy Indian meal. I have made dhokla with soaked lentils and rice, which are then ground up (like in a dosa or idli recipe). This khaman dhokla recipe is made with chickpea flour. It avoids the grinding required with other dholka recipes, so it is quicker to make. 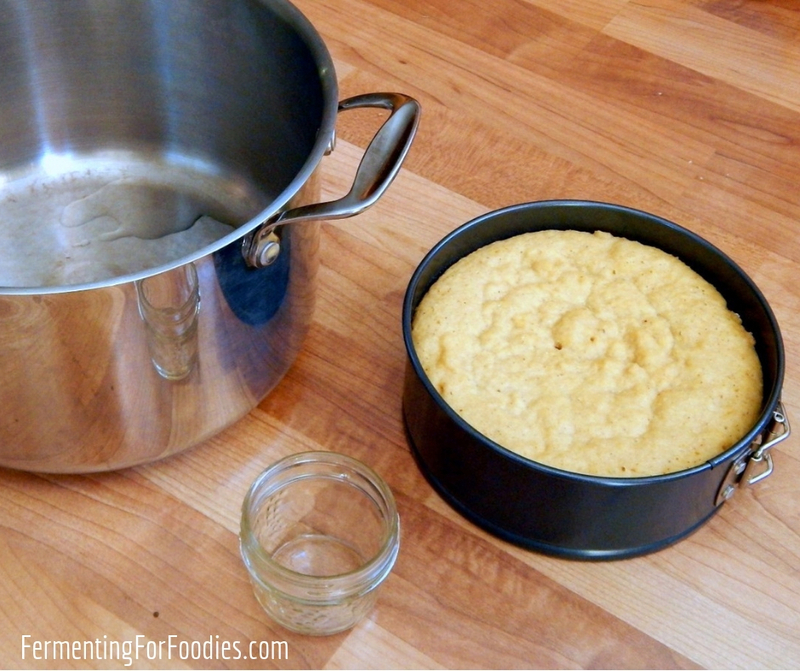 Mix the chickpea flour, yogurt and water in a glass container and allow to ferment for 8-12 hours. Mix in the baking soda and oil. Pour the batter into a 6" pan and steam for 10-15 min (until a knife comes out clean). 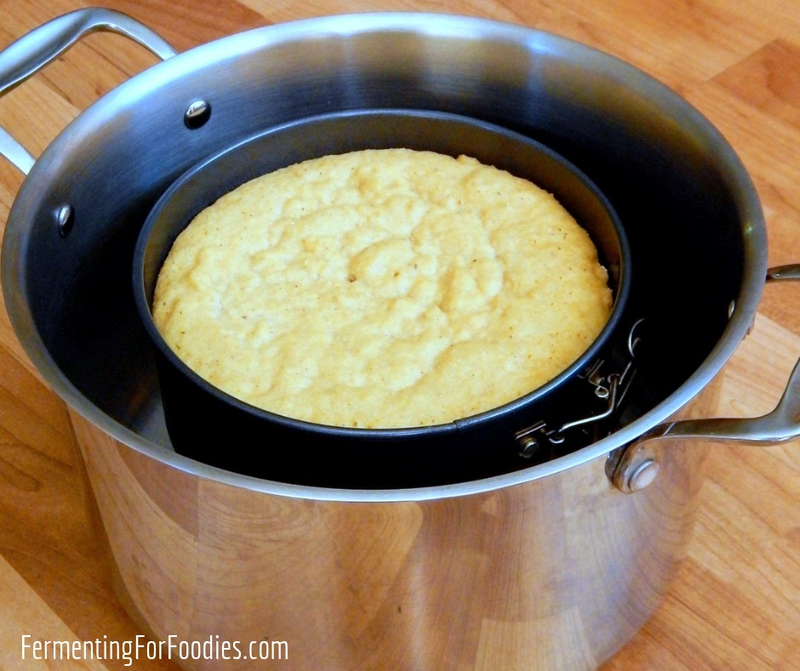 See below for an easy homemade steamer. Heat the oil and fry the spices and coconut until they smell fragrant and are just starting to brown. Pour the toasted spices over the freshly steamed dhokla. Top with cilantro and serve warm. Though yogurt is traditional in this recipe, milk kefir or buttermilk will also work as well. 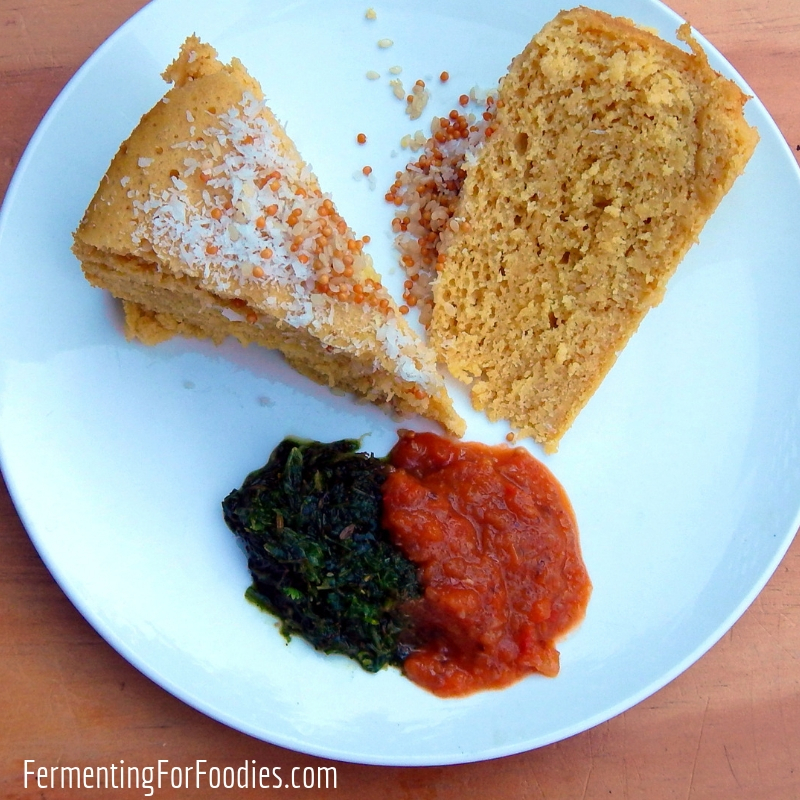 Instead of chickpea flour, you could use rice flour, lentil flour, garfava flour, etc. Though changing the flour would officially change the type of dhokla and the traditional flavouring. I think you can top your dhokla with whatever spices you want. I like serving dhokla with chutney, yogurt or lemon pickles. It’s a nice simple base for all sorts of delicious Indian flavours. here is a simple alternative. I’ve used it for everything from a traditional British pudding to dhokla. that is small enough to nest inside a large pot. Put 2″ of water into the bottom of the pot. Place a small jar on the bottom of the pot that is tall enough to sit just above the water level. Then place your pudding bowl on top. Steam with the pot lid on, occasionally checking the water levels. To keep the water from dripping off the top of the pot onto the pudding, either cover the pudding with tin foil, or wrap the pot lid in a tea towel. See below for photos of my set up. I am going to try this this week. I have really been enjoying your blog. I used to make tempe. We were making it in 1993. Then I started having a lot of failures. Thought it might have been the soy beans. I am interested in trying again. Thank you! I’ve never had a tempeh failure… so maybe it was your culture? Good luck this time around! I know that too much sausage and fermented meats can cause cancer because of the salt and nitrates. And kimchi, with fermented hot peppers can be problematic, because the hot peppers are hard on the stomach. 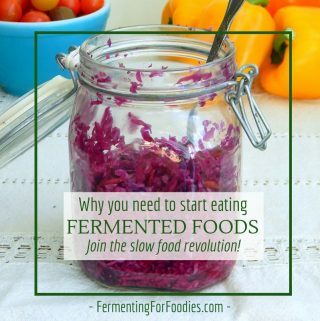 Sauerkraut and other fermented vegetables are beneficial for your stomach and digestive system. However, if you have issues with salt, try using less salt in your ferments by using a good vegetable starter. (I think I link to one in my Resources section). Can I use greek yogurt or plain yogurt instead of Kefir? 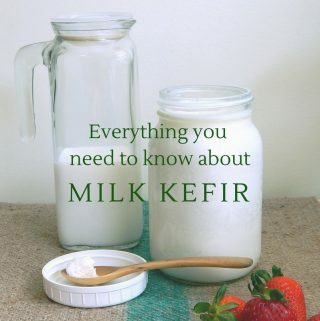 Yogurt or kefir will both work. I would avoid Greek yogurt as it is too thick.